Front Lawn Lacks Edges—the house is usually placed near the middle of the lot and this gives the lawn a feeling of a “no-man’s land” because of its openness and undefined edges. Driveway Dominates View—the driveway is a dominant visual element of many front yards and it’s not very appealing to the eye. When cars are parked in the driveway, there is often little or no room for people to walk except along a narrow edge or on the lawn. This is very inconvenient in wet weather or during the winter when snow is piled along the edges of the driveway. Prominence of Garage Door—a garage door that directly faces the street becomes a significant visual feature of the front yard. When the driveway is lined with shrubs, it actually accentuates the garage even more because it forms a noticeable axis that leads the eye towards it. This tends to minimize the front door, making it insignificant and secondary. Entry Walk Too Narrow—the walk leading from the driveway to the front door is typically about three feet wide. This dimension is too narrow and forces people to walk in a single file fashion to the front door. Entry Walk Hidden from View—another problem with the entry walk is that it’s not easily seen, especially where it connects to the edge of the driveway. In these cases, there is nothing to acknowledge or call attention to the location of the entry walk and visitors have to figure out their way to the front door. Entry Walk Lacks Visual Interest—entry walks with little or no visual interest do not provide a memorable visiting experience. And the walk’s pavement material often lacks distinct character or appeal. It is simply a rather dull environment to walk through to get to the front door. 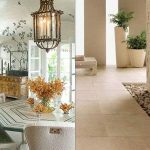 Entry Foyer too Small—a concrete pad or stoop located at the front door serves as the outdoor foyer or arrival area. It is often so small in size that on one can stand on it without getting hit in the face or stepping away from the stoop while the storm or screen door is being opened. Entry Foyer Lacks Enclosure—the entry foyer often lacks an adequate sense of separation from the street and the rest of the yard. The stoop is often exposed directly to the street or even to the neighbour’s house across the street so everyone can easily see the comings and goings of visitors. Also, these entries are apt to be exposed to climactic elements such as hot summer sun, cold winter wind or precipitation. This can make it uncomfortable for a visitor to stand very long outside the front door. Hidden Front Door—this is an opposite problem to lack of foyer enclosure that often results from overgrown plant materials screen out the view of the front door. For a first-time visitor, not knowing exactly where the front door is can be an uncomfortable and confusing feeling. 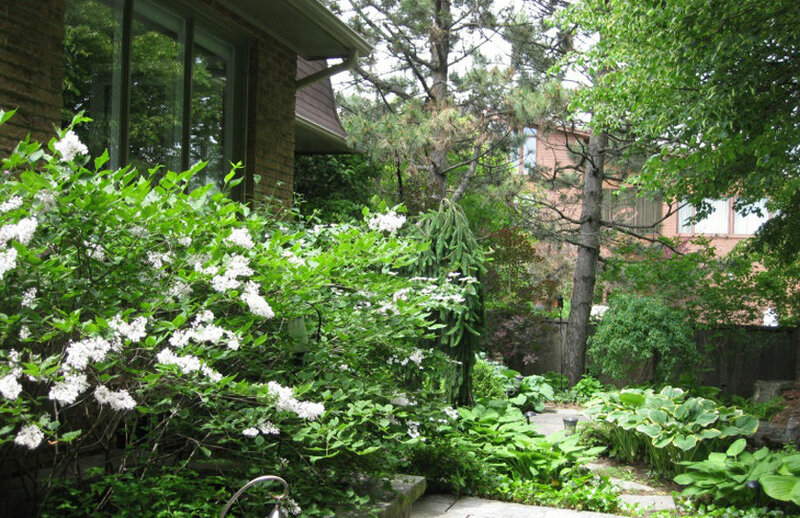 Overgrown Foundation Planting—in many front yards plants are placed next to the house’s foundation. This is a throw-back to the Victorian era when foundations were exposed and so shrubs were used to hide them. These shrubs, typically evergreen for year-round colour, are often manicured into geometric forms such as pyramids, cubes or spheres. A major problem with many foundation plantings is that they are overgrown to the point of obstructing windows. Scattered Plants in Lawn—randomly placed trees and shrubs that fill the lawn area often make manoeuvring a lawn mower like driving through an obstacle course. 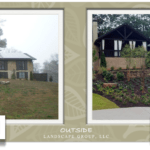 Little Enjoyment of Front Yard—many front yards lack a memorable image or style and provides little opportunity for outdoor living enjoyment. There are few places to sit, have a cup of coffee, talk to a friend or read a book. 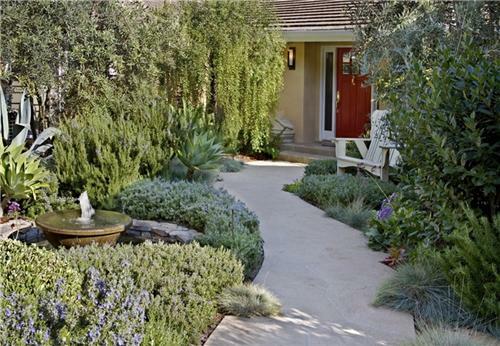 Give attention to arranging the plant materials at the front of the house to establish “curb appeal”. As well, add “zones” for outdoor enjoyment; perhaps a bench at the front porch or statuary to enhance the entry path. Consider the path and width of walkways and stoops. Make sure your front door is the focal point and that it provides some privacy at the front entrance. This way you’ll enjoy your front yard more and send a welcoming message to visitors. Call us at (416) 301-7281 or send me an e-mail at sally@outdoorroomslandscapedesign.com for a free consultation.